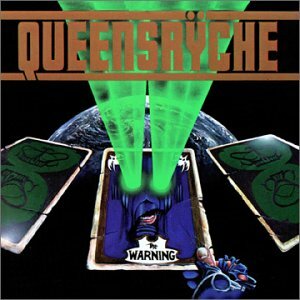 First studio album but second release by QUEENSR?CHE, "The Warning" is pretty much in the style of their self-titled debut EP: heavy metal in the vein of MAIDEN, with elegance, melodies and only slight progressive touches. Partially inspired by George Orwell's 1984, the compositions, were quite elaborated and refined compared to other metal bands, and deliver an impression of grace carried by Geoff Tate's incredible vocal range. The powerful and epic opener "Warning" is just great! "En Force" is also nice with its galloping riff, whereas "Deliverance" is a little more original with its melody changes. More complex and melancholic, "No Sanctuary" calms down the pace, while the cool "N M 156" sounds a bit futuristic. More personal and in the style of QUEENSR?CHE's next opuses, the aerial "Take Hold The Flame" is touching, due to Tate's particular plaintive and piercing singing. On the contrary, "Before The Storm" and "Child Of Fire" are neither very original nor remarkable, but remain however pleasant. More interesting is the 10 minutes mini-epic "Roads To Madness", the only genuine progressive track of the disc. On a dark and haunting ambiance, this evolving suite alternates slow, thrilling and hazy atmospheres, as well as heroic passages. One of QUEENSR?CHE's best tracks from the 80's. With "The Warning", the Americans have not fully emancipated from their British metallic elder brothers yet. Not as complex and sophisticated as, say, FATES WARNING, the music is still very influenced by IRON MAIDEN. Nonetheless, although lacking originality and personality, the quality and inspiration are already present and the compositions display discrete melodic and progressive elements that will developed in their further records. A promising and convincing first studio album anyway. I'm warning you: If you're looking for challenging songs, do not pick this one, but if you just want powerful and elegant 80's heavy metal, "The Warning" is exactly what you need!